ELMSFORD, NY, U.S. – Urnex has announced the introduction of seven products to its robust global portfolio of cleaning solutions. These products will be presented for the first time at the 2019 Specialty Coffee Expo in Boston from April 12-14. “The items we are launching at SCA Expo this year exemplify the breadth and depth of Urnex’s expertise in cleaning chemistry and manufacturing,” said Rusty Snow, President. Roaster Sprayz is a high foaming cleaning spray that dislodges and removes buildup on coffee roaster parts, including chaff collectors, cooling trays and impellers. Roaster Soakz is a powdered cleaner that, when mixed with water, creates a potent soaking solution able to penetrate and dissolve heavy buildup on removable roaster parts. Stainless Sprayz is a liquid spray that cleans and protects stainless steel surfaces, eliminating smudges and fingerprints, while leaving behind a streak-free shine. Stainless Wipz are disposable cleaning wipes that remove residue, grease and fingerprints from stainless steel surfaces. SuperGrindz are the world’s first cleaning tablets that are able to safely and effectively clean grinders within superautomatic espresso machines. One-Pro is a powdered formula designed to clean and ensure the safe preparation of cold beverages in equipment including granita machines, bubblers, iced tea and cold brew dispensers. Phosphate-Free Cafiza takes the industry’s most iconic cleaning product and delivers to its high standards of efficacy, without the inclusion of phosphates in its ingredients. Since 1936, Urnex Brands, LLC. has manufactured specialty cleaning products for the coffee industry. Today, Urnex’s portfolio of liquids, powders, tablets, sprays, wipes and capsules are distributed in over 70 countries around the world. With headquarters in New York, Urnex ships from distribution centers in Holland and Hong Kong. 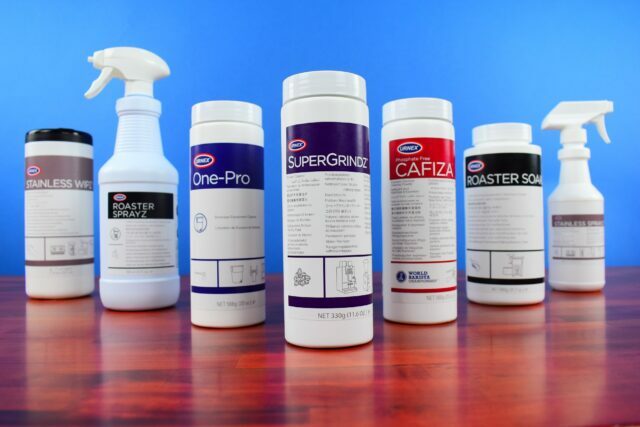 In addition to its own branded portfolio, Urnex also offers a full suite of R&D and manufacturing resources for custom development of co-branded and machine specific cleaning and descaling products. For more information about Urnex, or to pre-order any of the items mentioned above, please contact us by telephone at +1.914.963.2042 or via email at info@urnex.com.